Last year, we began researching walking labyrinths after reading an article about one of the most well-known labyrinths in the world, the Chartres Labyrinth. We’re hoping to make our dream of installing a walking labyrinth at the Inn on Mill Creek a reality this year. 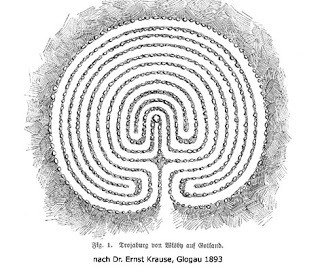 A walking labyrinth is different from a maze in that a labyrinth has a single path to the center and back out, and is therefore easy to navigate. It’s used for meditation, clearing one’s head and relaxation. Plus, with outdoor labyrinths, you get to use the labyrinth as a way to enjoy nature. We’ve found that the Labyrinth Society is a great educational resource where you can learn all about the history and symbolism of labyrinths. An entire section of their website is dedicated to the many different types of labyrinths, which has been very helpful to us in determining what kind of labyrinth we want. We were originally going to construct a medieval labyrinth like the one at Chartres, which dates to somewhere around the year 1200. However, when we were doing our research, we learned about several labyrinths in Sweden that are much older than the Chartres Labyrinth. Brigette’s dad’s parents are both of Swedish descent, so upon learning that Sweden has labyrinths (about 300 of them, some of which are estimated to be 2,500 years old), we thought, why not pay homage to the Dahlberg family with our own Swedish-style labyrinth. Many Swedish labyrinths were thought to have been put in place by superstitious fishermen as a way to trap spirits that brought bad luck. Can you imagine a fisherman walking a labyrinth in the hopes that a bad spirit would follow him in and look the other way while the witty fisherman ran out of the labyrinth? Since we don’t suspect we need to divert any spirits away from fisherman getting ready to head out to sea, we’re hoping our labyrinth will serve to help our guests (and us) as an addition to the relaxing environment at the Inn on Mill Creek. Another website we’ve found to be very helpful is one where you can find the location (and photos) of labyrinths near you. It’s called the World-Wide Labyrinth Locator. You can search by city, state, even by the type of place that houses the labyrinth (B&B is an option). You’ll find that many labyrinths are located in churches and parks that are open to the public. Watch the blog for updates on the construction of our very own Visby labyrinth at the Inn!